Italian volunteers never cease to amaze students of Andiamo Educations Institutions (AEI) with their gifts. After Franco Fiorina completed building girl’s hostel, with the support of OLTRE CONFINE ONLUS, Alberto Sidio came up with his Zitsime team to drill a borehole for male students. As if this is not enough, Alberto is at it again. This time, he is drilling another borehole for female students in the campus stormed the campus. Alberto and his team started drilling the borehole on 7 May, three days after the completion of the males’ borehole. The two boreholes are expected to ease water problems at the campus. Once this female borehole is completed, AEI campus only will have four water sources. What a gift! 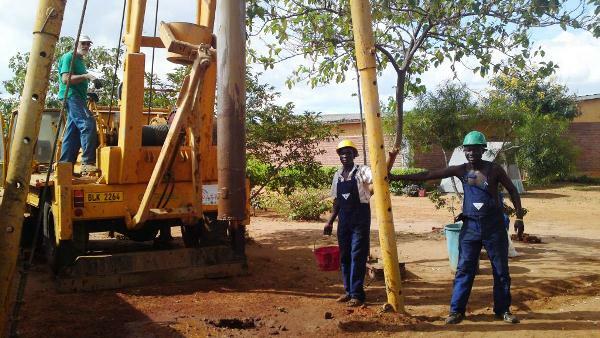 Zitsime team has been repairing and drilling boreholes in villages around Balaka and it operates under social development, one of the pillars of Andiamo Youth Cooperative Trust (AYCT). Andiamo Website Office will be updating progress of the drilling. This entry was posted in Education, News from Malawi, Social Development and tagged Alberto Sidio, Andiamo Education Institutions, Balaka, Franco Fiorina, Italy, OLTRE CONFINE ONLUS. Bookmark the permalink.